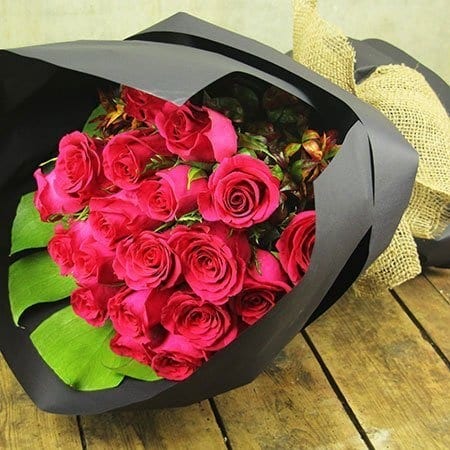 Deliver fresh roses in a divine bright pink offset with lush foliage and a smart black wrap starting from $49.95 for ten stems. Available in two bouquet sizes, these fabulous girly girl roses are perfect for any occasion! 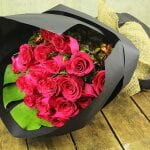 Order our divine pink roses online, email the team directly on sales@flowersforeveryone.com.au or call us on 1800 66 66 46. Ps. This bouquet would go perfectly with a box of `Truffology by Flowers` chocolate truffles - YUM. *PLEASE NOTE: The pictured rose bouquet is our `Premium` 20 stem option. The pictured flowers and special offer is available for Perth, Sydney and Melbourne Metro Region flower delivery only. left the flowers down on the mail boxes instead to warn the person by her phone or to ring the bell. I hope in the future to consider about these issues. 2019-01-30 Lovely flowers were delivered to my daughter on a super hot Melbourne day. The flowers were left at her door, in the shade, as I asked. The pleasant surprise was that they were in a big bucket of water! That’s great service!! !